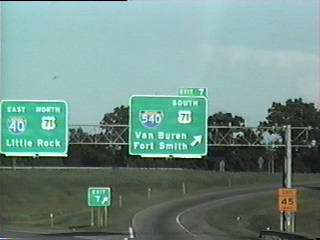 Interstate 540 begins at U.S. 271 near the Oklahoma state line and travels northeast through Fort Smith to Van Buren and Interstate 40. The route was truncated on April 21, 2014 when signs for I-540 north of I-40 at Alma were removed as part of a 30-day project to resign the I-40-to-Fayetteville/Bentonville stretch of I-540 as I-49. Counterintuitive to the standard Interstate numbering convention, mile markers and exit numbers along Interstate 540 increase southward from I-40 to U.S. 271. Originally commissioned as a spur from I-40 at Van Buren southwest into Fort Smith, Arkansas, Interstate 540 was signed as an east-west route. The designation was extended southward to the Oklahoma state line as approved by AASHTO on October 28, 1978. Interstate 540 was eventually extended northward in lieu of designating the new corridor linking I-40 with the Fulbright Expressway (U.S. 71) at Fayetteville as Interstate 49. Built in stages, the freeway was initially signed as Arkansas 540. The Fayetteville bypass for U.S. 71 was completed in 1971. The first segment of Arkansas 540 opened to traffic in 1995 between Interstate 40 and Mountainburg; a subsequent extension in 1998 brought the state highway freeway to Fayetteville. With major cuts through the Boston Mountains coupled with the Bobby Hopper Tunnel, this freeway was considered an engineering marvel. Located between Exits 34 (220) and 45 (231), The 0.3 mile long tunnel opened in 1999 and is named for a former Arkansas Highway Commission director. Arkansas applied to AASHTO for designating the new freeway corridor between I-40 at Van Buren and U.S. 71 Business north of Fayetteville as Interstate 49. AASHTO denied that request on April 25, 1997 and subsequently approved Interstate 540 for the corridor on November 14, 1997. A condition of the approval was that it would be initially signed as a future route. The Interstate 540 extension was made official on January 8, 1999, when the completed route was opened from I-40 north to Fayetteville. I-540 was signed with north/south cardinal directions along the new section to Fayetteville and resigned along the original spur into Fort Smith. At no time did I-540 or Arkansas 540 carry the U.S. 71 designation; U.S. 71 stays along the Boston Mountains Scenic Byway to the east. 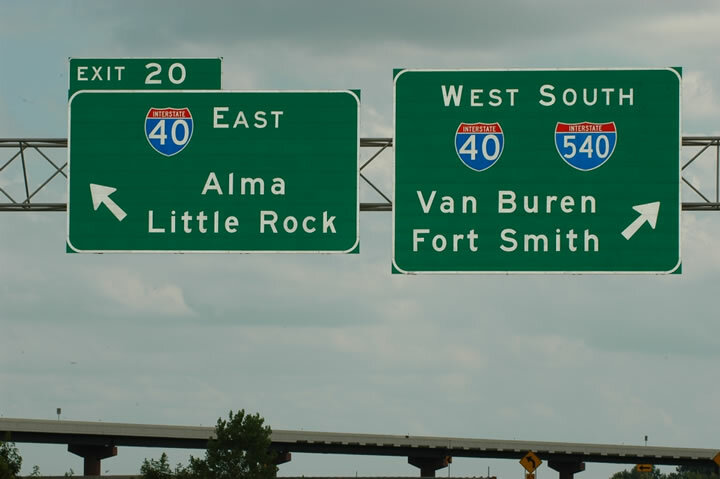 Prior to 2014, Interstate 540 combined with I-40 west five miles from Alma to Van Buren. Photo taken by Jeff Royston (08/15/04). In 2001, Interstate 540 was extended once again, this time to the city of Bentonville (perhaps best known as home of Wal-Mart) at Exit 93 (U.S. 71). 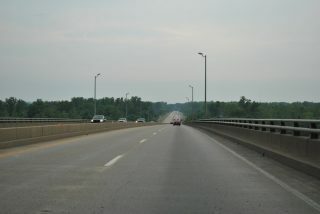 Interstate 540 south across the Arkansas River. The bridge opened in 1967. Photo taken 05/06/12. Exit numbers along the original Interstate 540 into Fort Smith counted upwards from north to south. Prior to the 1999 extension, Interstate 540 concluded at I-40, 7.3 miles east from the Oklahoma state line. Vidcap taken 05/28/95. Missouri Department of Transportation (MoDOT) efforts resulted in the conditional approval by AASHTO on October 15, 2011 to begin signing Interstate 49 along the U.S. 71 freeway between Joplin and Kansas City by December 2012. This action prompted AHTD officials to submit an application at the Fall 2012 meeting of the AASHTO Special Committee on U.S. Route Numbering to redesignate all of Interstate 540 north of I-40 as I-49.6 Approval for the redesignation was granted by AASHTO on October 21, 2013. That portion of I-540 north from I-40, at an interchange five miles east of the current north end near Van Buren, was redesignated Interstate 49 in April 2014. This transferred 72 miles of I-540 to I-49 and left the original Interstate 540 spur into Fort Smith. 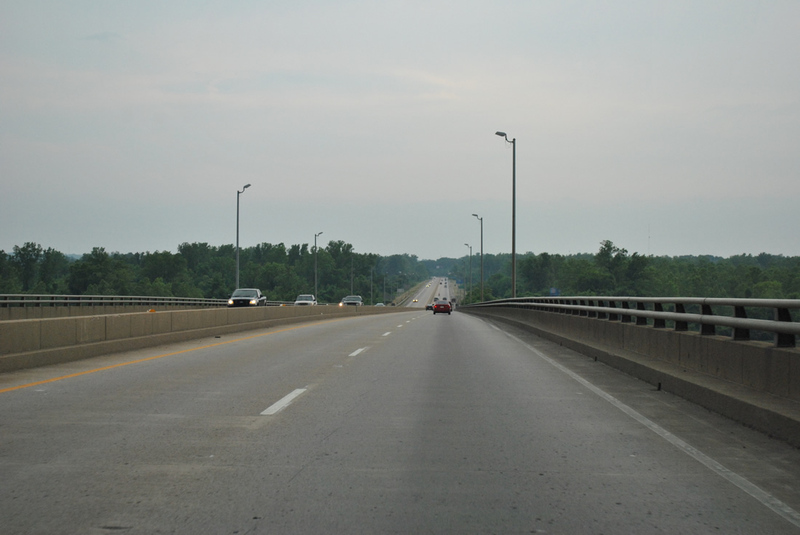 Interstate 49 will not follow this segment and instead follow an alignment toward Fort Chaffee. Seven miles of this future I-49, between U.S. 71 and Arkansas 22, are already opened to traffic. Interstate 40 & U.S. 71 west, one mile ahead of their split at I-540. U.S. 71 combines with I-540 south through Van Buren and Fort Smith. Photo taken by Eric Stuve (12/19/02). I-540 & U.S. 71 arc southwest through the city of Van Buren between I-40 at Exit 7 and the Arkansas River. Photo taken by Eric Stuve (12/19/02). Entering the trumpet interchange (Exit 7) with I-540 & U.S. 71 south on Interstate 40 west. Photo taken by Eric Stuve (12/19/02). Interstate 540 south concludes at Exit 14 with U.S. 271 north into Fort Smith and Arkansas 253 south to Bonanza. Photo taken by Martin McMahon (12/09/02). U.S. 271 extends southwest from I-540 along an expressway into Oklahoma. This confirming marker stood just ahead of the state line and the exchange with Oklahoma 112 to Arkhoma. Photo taken by Martin McMahon (12/09/02). U.S. 271 crosses the Oklahoma state line just ahead of the diamond interchange with Arkansas 253 south and Interstate 540. Oklahoma State Highway 9 concludes a cross state route from the Texas line near Badge here. Photo taken by Martin McMahon (12/09/02). U.S. 271 turns north at Exit 14 to U.S. 71 Business in Fort Smith. Arkansas 253 ties into the exchange with I-540 from the city of Bonanza. Photo taken by Martin McMahon (12/09/02). The first Interstate 540 reassurance shield appears just past the entrance ramp from U.S. 271 south and Arkansas 253 north at Exit 14. U.S. 71 combines with I-540 north in two miles. Photo taken by Martin McMahon (12/09/02). U.S. 271 turns west at the south end of Interstate 540 toward Le Flore County and the town of Spiro, Oklahoma. Arkansas 253 runs 2.1 miles south from I-540 to Arkansas 45 near Gurisco Lake. Photo taken by Martin McMahon (12/09/02). Backlin, David. “New Interchange u/c I-540 (AR).” Online posting, misc.transport.road, September 17, 2003. “Notice to Media: Interstate Designated in Arkansas.” Arkansas Highway and Transportation Department (AHTD), news release. May 16, 2000. “I-49 Shields Coming to Arkansas Soon?” online posting by Grzrd, AARoads Forum, August 7, 2012. Page updated April 23, 2014.